Monitoring air cleanliness is crucial for critical environments to ensure clean processes, drug safety, and patient health. A particle counter enables continuous monitoring in these environments. Particle counters can help guarantee particle counts are within acceptable ranges 365 days a year, instead of just the two days per year that certification occurs. Installing a particle counter can allow for detection of potential issues before the day of the inspection and action can be taken immediately. Particle counters detect and measure non-viable contaminants such as dust, mold spores, debris, and volatile organic compounds (VOCs). Particle counters can immediately identify a dramatic spike in particle counts and indicate potential issues within an otherwise sterile processing environment. 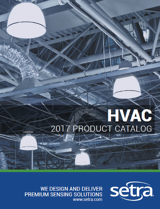 A spike in particles can come from a variety of sources; for example, a broken door seal or malfunctioning air handling unit. The immediate results provided by the particle counter means immediate action can be taken to resolve the issue. 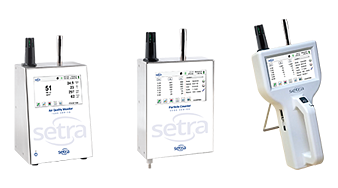 Additionally, a handheld particle counter like Setra's 8000 series can show the air flow is working, allowing the user to reduce air flow and conserve energy when particle counts are low. With a continuous particle counter like Setra's 5000 or 7000 series, non-viable particle counting occurs in real time. Monitoring non-viable particles is important because non-viable particle counts strongly correlate with viable particle counts, as non-viable particles often act as vehicles for other contaminates like bacteria. Not all critical environments are currently required to undergo particle certification. However, it is important to take particle counts into consideration in any space, not just critical environments. Particle counting can help ensure a critical environment is safe both now and in the future.